Routing in Incident allows you to automate your work flow process for new requests. It tells the system when and where to send incidents. Incidents can be automatically routed based on the Problem Type, Location, Bldg./Unit, Purpose, Project, or any combination of the five. Two of the most commonly used routing patterns are location based and problem type based. Location based routing automatically routes an incident based on its assigned location. Most commonly, it may go to a site resource user assigned to that location who is responsible for resolving simple requests before sending more complex issues on to the IT department. 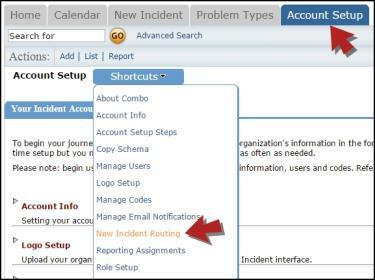 Click on New Incident Routing, or hover your mouse over the Shortcuts menu and click New Incident Routing. Under the Add section, choose the name of the location in the Location drop down box. Leave "No One" selected in the When Approved By drop down box. Under Route To Person / Work Queue, select a specific user's name in the top box OR the assigned work queue in the bottom box. Click the Add New button to save. This route now moves up to the list of routes at the top of the page. *Note: In the example pictured below, this route instructs the system: Any time a new incident is submitted for Admin Building, send the incident directly to John Doe who is the site resource for that location. Click on New Incident Routing. Under the Add section, choose the problem type from the Problem Type drop down box. Under Route To Person / Work Queue, select a specific user's name in the top box OR the assigned work queue in the bottom box that is responsible for that problem type. Click the Add New button to save. *Note: In the example pictured below, this route instructs the system: Any time an incident is submitted for the problem type of Hardware, assign the incident directly to the Hardware work queue.